Zaha Hadid's Opus by Omniyat, located in Dubai Business Bay, is under construction. 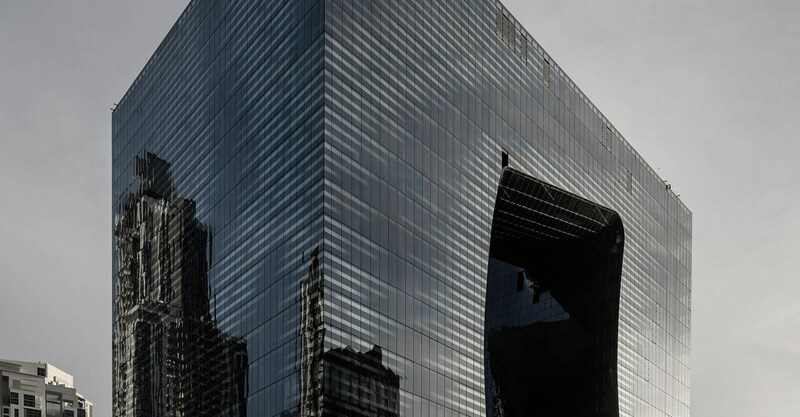 The project consists of two 20 story towers connected by a bridge, with the inner facades forming a seamless fluid glass surface, resembling melted ice. Following Agnes's involvement at design stage, we have finalized the system design, materials, technologies used, developed system integrated external lighting, addressed changes to the geometry. We also review the contractor's design, attend design workshops, performance testing, carry out site inspections. A visionary project - achieving this geometry has pushed the technical limitations of the industry. Flat, single curved, cold bent and hot bent glazing has been applied, in seamless integration, within wall, skylight and soffit systems, to create the double curved void surface. Undoubtedly one of the most challenging project in the region, we are using advanced 3D computing technology and building on our earlier experience and research work in freeform glazing methods to deliver this project.